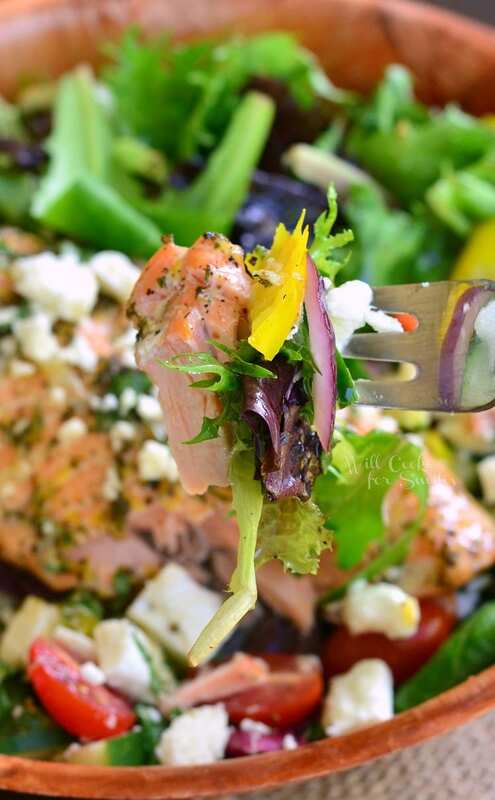 Delicious salad that’s bursting with fresh flavors. 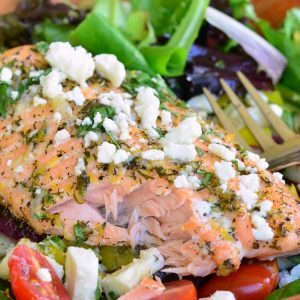 This Greek Salmon Salad is made with fresh Garlic Lemon Basil Dressing and topped with succulent salmon that’s been baked with lemon and herb marinade. How was everyone’s weekend? We had a beautiful weekend here. The weather was so lovely. It was the perfect mid 70s and partly sunny. That’s my ultimate preference for weather. I wanted to take advantage of this weather and do some landscaping and gardening. We bought our house last winter and unfortunately, we inherited a pretty terrible lawn and landscaping. Our house was a flip and the people who fixed it up did a great job inside but they only did some quick and temporary fixes outside. With the moving expenses being so high, I put off landscaping until this year. This year though, I’m going all out and ripping everything out to make it as pretty as I want it. The lawn is actually my husband’s baby but landscaping and pretty stuff, is all mine. I’m ripping out all the ugly bushes that have been bothering me for a year. Oh, and don’t get me started on the obnoxious red mulch! People seem to love red mulch but it drives me bananas. It has to go! So this weekend, I tackled the walk-up to the house that’s been an eye sore for so long. I made it into a flower garden on one side and pretty bird bath and flower sculptures on the other side. The new light brown mulch looks beautiful and it’s just a pleasure now to walk up to our front door. It may have taken me hours but it was so worth it. I walked around there for an hour after I was done. Most importantly, when I was done, I realized that I was STARVING! After spending most of the day outside, noone wants to eat anything heavy. A fresh salad is the best meal after an exhausting project. This salad is full of fresh flavors, fresh veggies and herbs. 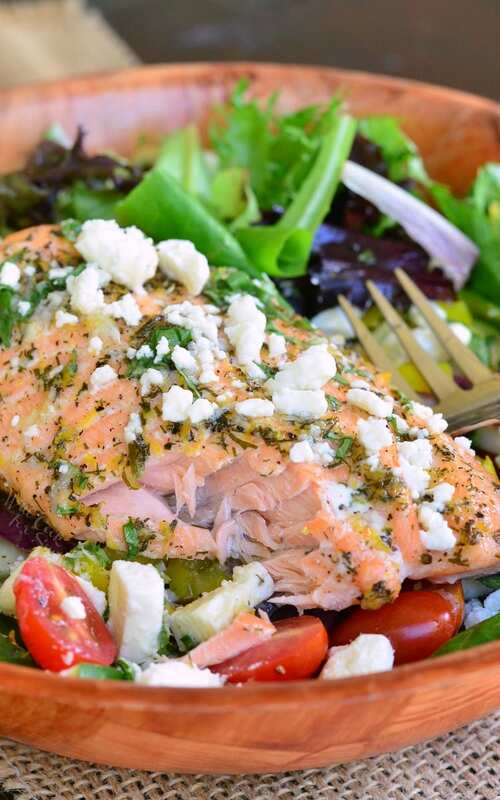 Can’t forget about a beautiful, juicy salmon that’s perfectly baked just for you. Preheat the oven to 425 and line a small rimmed baking sheet with parchment paper. Rub the bottom of the salmon with oil and place it skin down on the parchment paper. Mix together 1 1/2 tbsp. of olive oil, lemon zest, dill weed, salt, and pepper together. Rub the mixture all over the top and sides of the salmon. 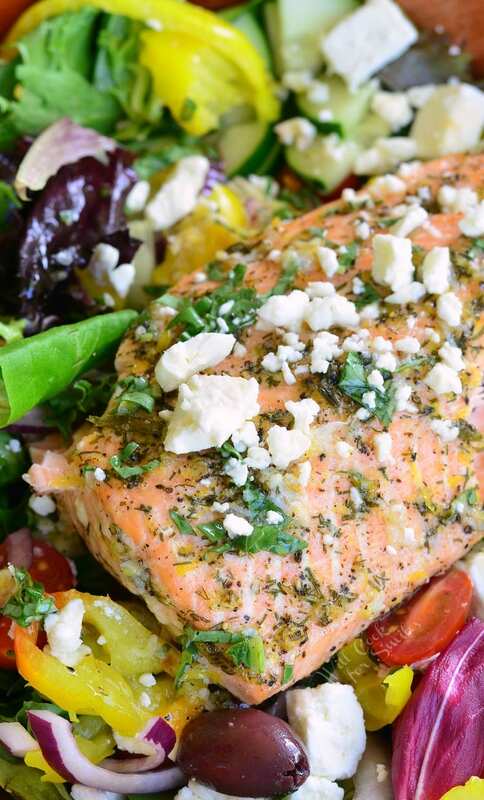 Bake for 13-16 minutes, depending on the size and thickness of your salmon piece. 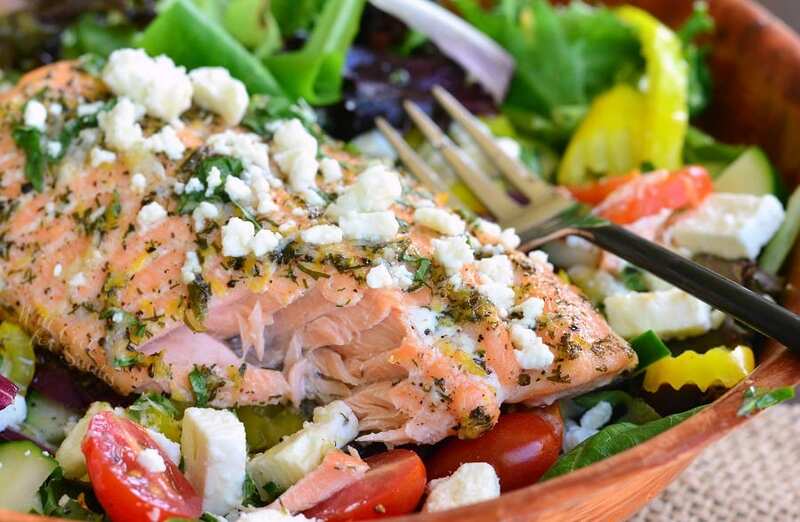 Combine your salad ingredients in a bowl and top it off with baked salmon. 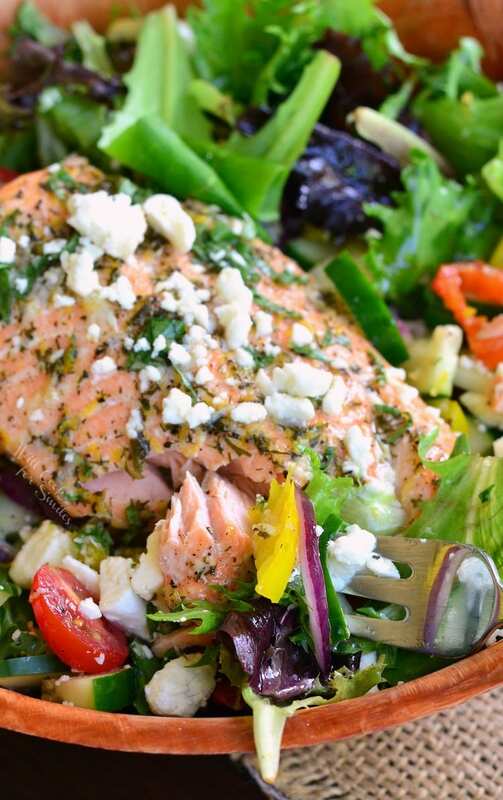 Mix all ingredients for the dressing and pour it over the salmon and salad. Thanks for sharing it salmon salad.